Many people are self-conscious about their smile and seek ways to improve it. Older patients in particular often ask me about ‘black triangles’, which have appeared at the base of their teeth. These are largely down to gum recession, usually caused by gum disease. It can also happen as part of the natural ageing process as well. Fillers can disguise the problem in a purely cosmetic sense. I spoke recently to the Mail on Sunday when the paper was running a feature on these ‘anti-ageing jabs’. Read all about it here. In a simple procedure, hyaluronic acid is injected into the gums to plump them up. This procedure has to be repeated every 6-9 months so it’s not a permanent solution. However, I wouldn’t advise anyone with active gum disease to have these fillers. It’s really important that they are only used once gum disease is under control and then they can actually promote gum healing after periodontal treatment. 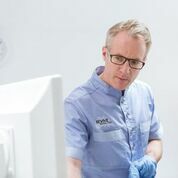 As with any oral health issue, it’s really important to talk to your dentist first and take advice on whether the treatment is right for you and how best to manage gum recession.